Ahhh yes, my favorite morning show hosts are back at it. Back at sounding rather, umm, well, less than intelligent. The discussion of the moment is that Palin isn’t “smart” or “educated” but that Obama is. And the proof of this is the fact that he graduated Columbia University and later attended, and graduated form Harvard aw School. Further, he served as the editor of the Harvard Law Review. And that’s where the hilarity begins. Brad makes the case that one cannot refer to Obama as less than intelligent unless and ONLY IF, the case be made that Obama gained entry to these schools via assistance of Affirmative Action. There’s a couple problems with this line of thinking. The Left has had a field day at the expense of Dubya’s intelligence. And Dubya is ALSO Double Ivy. In fact, he is the ONLY President to have earned an MBA. 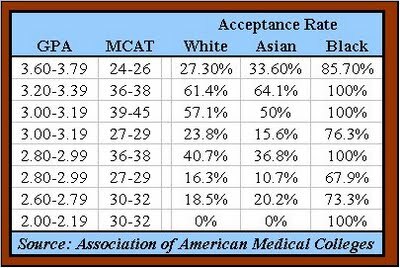 This shows that there is SIGNIFICANT advantage to being Black as opposed to being White or Asian. While there is NO evidence that would suggest that President Obama benefited from this advantage, to dismiss it off hand is rather short sighted. And that’s setting aside that the “Worst President in the History of the United States” isn’t also a genius based on the “Double Ivy” measuring stick. This entry was posted in Politics: National, Race and tagged Affirmative Action, Barack Obama, Brad and Britt, George Bush. Bookmark the permalink. Dear TR. Would large wodges of greenbacks to the university’s various funds also count as “Affirmative Action”? Would large wodges of greenbacks to the university’s various funds also count as “Affirmative Action”? Not sure I understand? Do you mean, “Can certain individuals get into a school they otherwise wouldn’t because they have parents that contribute large amounts of money”? I suspect that this might be true if your father was President of the United States of America as well.